At Sanders Theater on Thursday, Patricia Kopatchinskaja spiraled into the cosmos and delivered what was heretofore an inconceivable flight. It was rocket art via Violin Concerto No. 2 of Béla Bartók. Little doubt there should be talk aplenty around Boston about this young mentor of modernity whose US debut Thursday evening deserved the unanimous thumbs way up she received. Benjamin Zander’s Boston Philharmonic Discovery Concert went short (thankfully) on the usual lecture-demonstration, letting “the music speak for itself.” After but a few words and a single musical illustration, that of the very low notes of the fourth horn part in the Overture to Der Freschütz, excellently sounded by Breanna Ellison, the BPO set the concert in fine motion with the Carl Maria von Weber. In this woodland setting, all four horns in the hunt melded a golden classicism. Clean-cut orchestral balance coupled with certain caution allowed enough theatrical play in one of the most popular overtures around. The von Weber served not only as a delightful opener but as a select antecedent to the Bartók. Born into a family of folk musicians, rigorously trained in the classical tradition, and possessing the gift to explore, Patricia Kopatchinskaja iterated Bartók like none other I have ever heard. Could her wearing a red dress and going barefooted be construed as symbols of classical and folk traditions? Much of the time hers was a restrained physical presence that seemed to correspond to every facet of her left hand’s covering the entire fingerboard. That same kind of correspondence appeared with every shift of her right hand’s changing pressure and placement of the bow in unimaginable variation. At times, especially when she was not playing, she would swing around to her right toward the first violins, her eyes wide open gazing off in space, seemingly that space where she would find herself completely absorbing violin and Bartók. It truly was an unbelievable degree to which she at once humanized and spiritualized Bartók, summoning his very presence, this, in a virtually non-stop violin performance. Premonitions she so fabulously laid out in the opening movement she would further advance throughout the big concerto. By the second movement it was if we had been shot towards Saturn to find ourselves rapt in formidable mystery and munificent beauty. In the final movement, Kopatchinskaja landed us on earth and knowingness only to send us out again and again in pursuit of the other world, all the while the brass fanfare intervening as if putting us on notice. What a giant discovery, thank you all! Zander and the entire BPO spun way out into orbit with Kopatchinskaja, and it was all miraculous and unforgettable. We listeners abandoned ourselves, exported to planet Bartók. As one listener put it, “how can anyone follow that?” BPO did for a while. The lyrical in the Brahms Symphony No. 2 in D Major, Op. 73 soared sumptuously out of the cellos in their famous theme faintly suggesting the composer’s treasured lullaby. Altogether, the first movement, Allegro non troppo, was well on its way to proving experienced programming. Zander headed the orchestra toward that Brahms kind of spirituality. A kinder ebb and flow illuminated not just the contrasting but the complementary elements of the German’s symphonic voice to that of the Hungarian’s. Yet, the further the symphony unfolded the further adrift went the Brahms feel, that devoutness that shadows Bach. The second movement, Adagio non troppo, began to untighten, lose its organic nature. Why the oboe obviously subjugated its harmonious counterparts, the other woodwinds, in stating the main theme of the Allegretto grazioso (quasi andantino) puzzled. The Presto ma non assai puzzled not, its lightness relaxed, its buoyancy introduced optimism. The fast paced exchanges between strings and winds were pure delight, the ensuing tutti, though, exceeded Brahms forte marking. The closing Allegro con spirito left the joyous favoring outright excitement, but the effect was an uncomely stiffness and edginess. 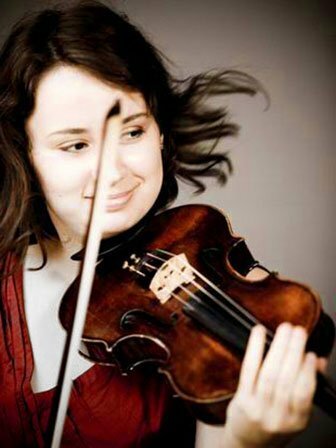 There are three more opportunities to catch Patricia Kopatchinskaja and the BPO. Do not miss out on this excellent Discovery! While most core repertoire music works are generally not well UNDERSTOOD, this symphony is particularly widely MISunderstood. “the music speaks for itself”. Yes, because there is a law: No orchestra hides its tail before Beethoven/Brahms. What a glorious concert, indeed. Spectacular violinist!!! Ben has a tremendous talent for identifying emerging talent. He brought us Gabriela Monteyo twice in seasons past. Now the BSO has programmed her. About time. Slow learners. They didn’t notice (or proclaim) that this year’s Cardiff Singer of the World had studied at Tanglewood. The reason I chose not to speak about the Brahms at the BPO Discovery Series concert was because I was, and I suspected, the audience too were, at that moment, so overwhelmed by with Patricia Kopatchinskaja’s playing of the Bartok concerto – so beautifully and poetically described by David Patterson in his review – that I couldn’t see adding words about Brahms. So I simply decided on the spur of the moment to dispense with the lecture. I did deliver a pre-concert lecture on the Brahms at each of the subsequent concerts. That was a gracious explanation. I thank thee, Sir, on thxgivin’Eve. I’d often like to think the Brits have a unique talent in marketing. (The shape of this country is perhaps partially a result of that…) People discovered long ago that education could well be a form of marketing. Through the ‘education’, audience are ‘told’ of the stories, one way or another. In this sense, “the music speaks for itself”. I look forward to the Bruckner 7 concerts in Feb (more so to the BSO B9 in Jan). I’ll see how thankful I will be to those concerts.